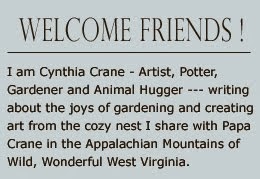 Cynthia Cranes Art and Gardening Goodness: Around The World Blog Hop: Sharing My New Video "One Fine Day ...."
Around The World Blog Hop: Sharing My New Video "One Fine Day ...."
"One Fine Day at Cynthia Crane's Pottery"
Well, the day has finally arrived for my turn in the Around the World Blog Hop. I'm supposed to answer a series of questions about my creative process....yada yada yada....but rather than ask you to spend 10 minutes reading all about moi (which might bore you), I thought you might rather only spend 5 minutes watching a neat little video my daughter helped me make recently. I think it should tell you all you really need to know! I certainly hope you enjoyed that! Now I must give a big THANK YOU to my blogger friend Jan of Sew and Sow Farm for inviting me to participate in this Blog Hop. A real "salt of the earth" gal is she, helping manage a huge farm in north George while she makes time to create the most splendid quilts you ever did see. Jan's current specialty is designing and stitching quilt blocks called Patchwork of the Crosses using the English Paper Piecing method. 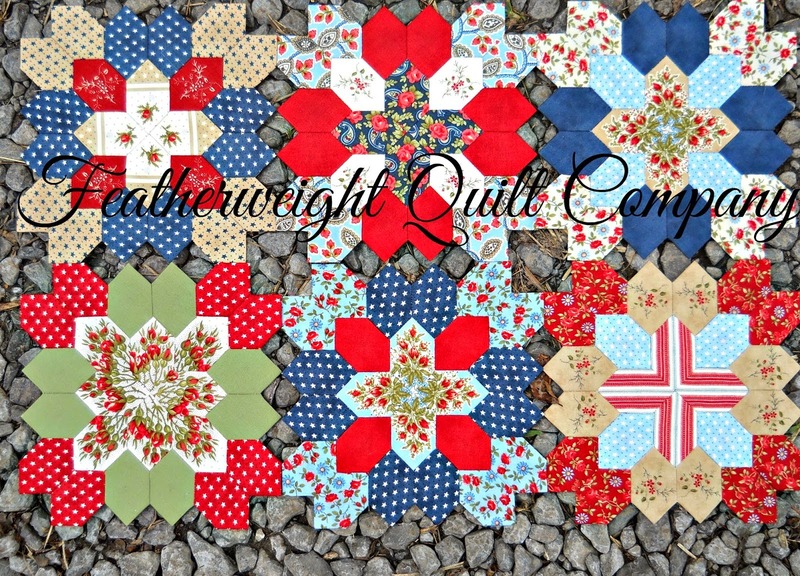 She even offers her lovely quilt block kits and supplies in her Etsy shop, FeatherweightQuiltCo. 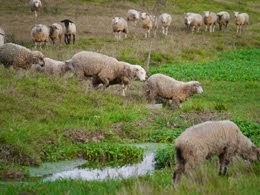 Her blog is full of heartwarming photos and stories about the animals on her farm, interspersed with loads of helpful information about quilting. And she has the most wonderful and generous Giveaways, too! 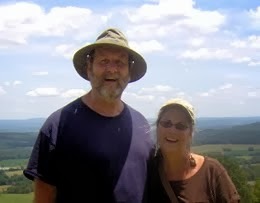 So be sure to visit her blog and tell her I said "Hello"! Well, friends, this will be my last post for a few weeks as I prepare for the upcoming Shenandoah Valley Fiber Festival in Berryville, VA at the end of this month. My first fiber art show! Yay! Button, pendants and beads.....and stuff with bunnies and sheep painted on, will be the order of the day. Buttons, pendants and beads, oh my! But these lovelies are being fired in my kiln as I write, to be listed in my Etsy shop on Wednesday. Oh, what but that the kiln gods will be kind to me tonight as many many hours of love and devotion went into the making of these precious little jewels. Thanks so much for visiting and watching my new video! 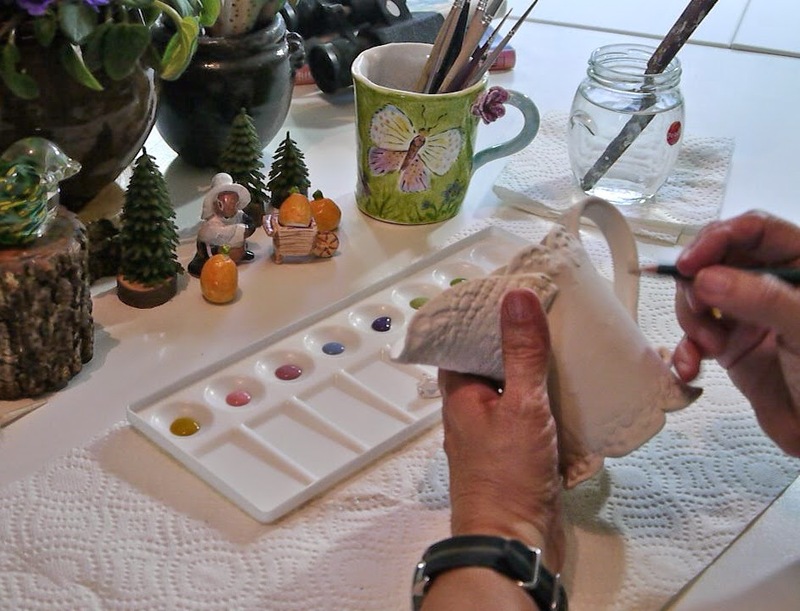 Dear Cindy ~ It was a thrill watching you paint, and seeing you walk through your gardens. It made me feel happy. I wish you well at the show, I'm sure you'll do fantastic with your little gems. The kiln is loaded with fantastic pieces. We have a fiber festival here in Kentucky and I always enjoy visiting and buying! Your daughter should become a film maker, nice video! I have to say I think yours is the best blog hop blog. I loved loved your video. That piece you were painting is so pretty and so is your garden. You live a charmed life. Cynthia Dear!! That was the best video!!! I thoroughly enjoyed it!! The music, the flowers, the sweetiepie doggie, you!,your art, the feather, the sink, the hat...the garden, everything, loved it all!!! I sure love the look of that kiln full!!!!! Beautiful fun pieces, I also love those cos!!!! Fantastic post Cindy! I LOVE the video. You have such a beautiful garden and I really enjoyed watching you paint! Your work is so pretty! Thank you for sharing with us! Cynthia! I see my dear friend Jeri Landers is here! Cynthia, it is such a grand pleasure to meet you! I am very glad you came to visit me via Lin's blog and now I get to meet YOU and see your lovely work here! 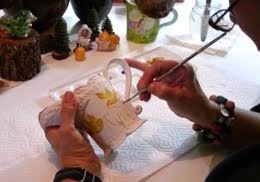 There are so many great artisans to meet and join in with the celebration of life. 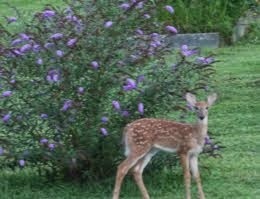 Your blog is a festival of colors and animals (I LOVE NATURE!) and I don't know where to even begin! I am following you on Pinterest now too! Oh my, your turquoise bird on your Etsy site, DARLING! Your cutting garden is so beautiful and vibrant! I LOVE the video! I enjoyed every moment! It's fun to watch artists paint! I love the music, too! Thank you, Cynthia! Loved your video....and the music. I love the Lill' Mushroom!! Hi Cynthia. TY for visiting my humble blog! About Chinese Lanterns.....they are very invasive. I have them in a galvanized tub but originally had them in the big garden where they were taking over! I love pottery...old and new. Every where we traveled I bought a piece as a rememberance. Yours is very beautiful and unique! Such talent! 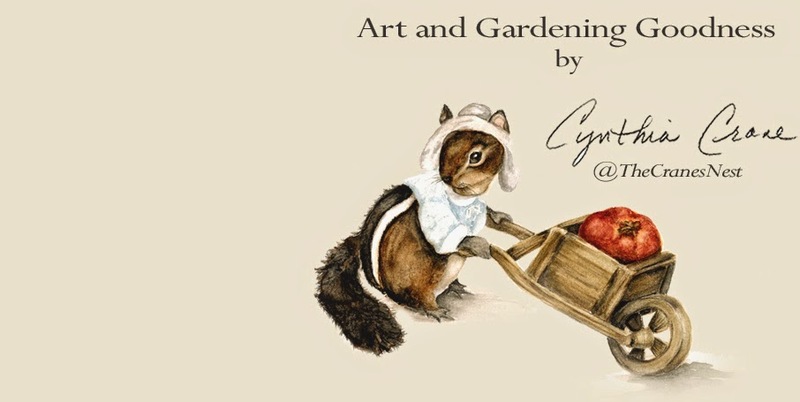 Loved the video-seeing the painting from start to finish and your beautiful garden! Ha! I'd always rather watch an artist in action that read about it. Good idea! Hope your show goes well and that it brings you great pleasure. Hello Cynthia, what a sweet video. Love the setting with you in your cute hat, lovely flowers. Good clean living. Such talent you have for creating beautiful pieces. Thanks for sharing. Have a wonderful day.